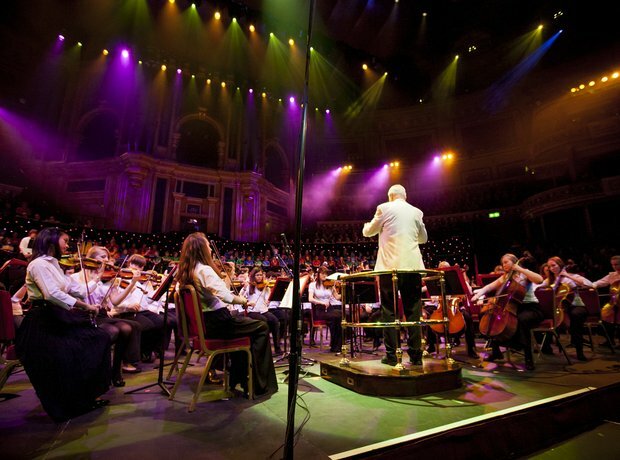 There are over 100 young musicians in this orchestra aged between 13-18 years old. Take a look at the orchestra in rehearsals and performing throughout the year, culminating in their performance on stage at the Royal Albert Hall. French horns in rehearsal before a big performance. Performing at the gala concert in Derngate, Northampton in June 2012. Rehearsing for the gala concert in Derngate, Northampton in June 2012. Violins in rehearsal for the gala concert in Derngate, Northampton in June 2012. The woodwind section during the performance at the gala concert in Derngate, Northampton in June 2012.